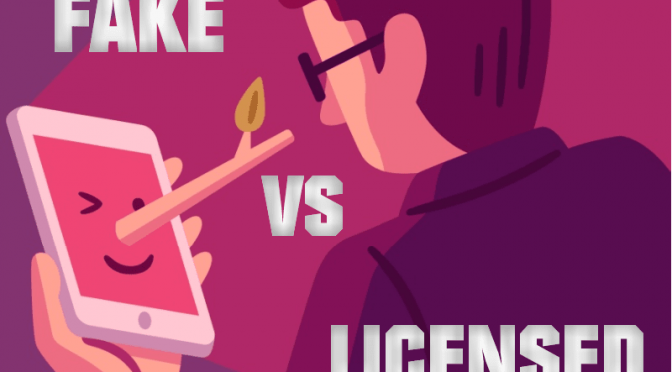 What’s the difference between original license software and “false” fake script software? Why is it important to know the difference between them? The point is that a casino with a license uses the original license software from well-known developers of video slots. The casinos that don’t have a license, as a rule, use script software, i.e. fake slot machines. The gambling establishment with the rouge software won’t obtain a license from any self-respecting entities that is entitled to do so. Therefore, possession of a license is a crucial factor for a casino that needs to be considered primarily. The Random Number Generators (RNG) responsible for randomness of drop-outs of winning gaming combinations in license casinos are regularly inspected by independent international organizations. In addition to it, the game software produces themselves always track clearly if casino owners use their software without any manipulations, which make changes in it. And it’s difficult to achieve it. Because all license slots are placed on certain servers of their producers. And players in the casino with license slots just can connect to these servers. Thousands of casinos that have acquired the right to use license games use the original slots, connecting users to the same servers. That is, all slots of the same developer in different casinos are no different. What is more, nearly all manufacturers of gaming software draw enormous jackpots. They are formed from a certain percentage of each bet made on any slot of this producer in all casinos where there are his games. Accordingly, a very large win is possible even in a new casino using the original license software. What happens in script casinos using the rouge tampered software? These casinos have nothing in common with the license slots with algorithm of software operation. There exist a copy of the slot with spinning reels and dropping out gaming combinations. But it’s not the tested branded RNG from the games producer, who is responsible for the result of each rotation (spin) here, but the casino owner via administrative panel of his gambling establishment. He sets the algorithm of gaming machines operation in accordance with his own interests. The game can be downloaded from anywhere, but not from the server of the game software producer. Obviously, these slots are not connected with any uniform system of jackpots. If something is drawn in such casinos, then it’s anything, but not brand-name progressive jackpots from the manufacturer. Accordingly, casino owner is at the same time a “god for success”. After all, he’s the only one who makes a decision – to give you something for “lure ” or to strip you of. To distinguish original slot machine from fake ones is quite simple. All license games are downloaded only from the servers intended for a particular producer. Clear up, where (to which server) the slot machines apply in the online casino during download. The appeal to the server occurs during the download and demo versions of the original slots, so you needn’t make a deposit and play for real money for inspection. In the window of downloading game click right and open Adobe Flash Player settings. In it, you’ll see the server address from which the game is loading. Each producer has servers of his own and on their names you’ll determine easily if they original ones or just cheap scripts. The second version: click right on the icon of the downloading slot and click on “explore the code” or “explore the item” in the window that opens (according to the browser you use). And you can see there from which server the game is loading. So, you can determine on its name, whether it’s a license slot or a fake one. If slots from different producers in an online casino are loaded from one server (with one name), and this server is not official at least for one of the manufacturers, then they are 100% fake slots. License slots NetEnt must have a special component of the server name .casinomodule.com. In the original Microgaming slots there should always be a component of the name of the server .gameassists.co.uk. Quickspin. The server name must have a component.cloudfront.net. If casino has few slots of this producer, they can be connected via Quickfire server. Then the server address will be the same as in Quickfire. In this case, in the original Quickspin slots there must be a component of the name of the server .gameassists.co.uk. When playing for real money, original Endorphina slots must have the server start.endorphina.com. License slots iSoftbet are downloaded from controlling server static-games.isoftbet.com control server. Original Betsoft slots must include the server * .betsoftgaming.com server.